In Jin Shin Jyutsu, mudras are finger positions, or poses, which enhance the flow of energy in the body. 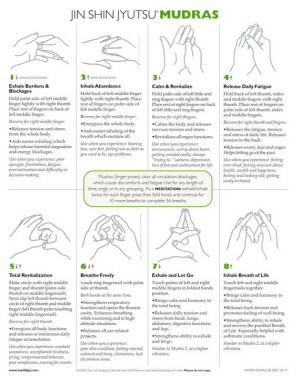 This chart has eight mudras and includes an original drawing of each mudra, instructions on how to achieve the finger pose, the benefits of each mudra (see detail below), and suggestions on how and when to use them. While the mudras are introduced to the self-help student in Jin Shin Jyutsu Self-Help Book 3 and the practitioner student in JSJ Text 1, this chart combines that information with information from two other Jin Shin Jyutsu sources for a comprehensive presentation. Mudras Chart © copyright 2014, Karen Searls. All rights reserved. The Mudras Chart is for your personal use and does not come with distribution rights. No part of this chart may be reproduced, stored in a retrievable system, or transmitted in any form or by any means – electronically, mechanical, photocopying, recording, or otherwise – without written permission of the copyright holder.